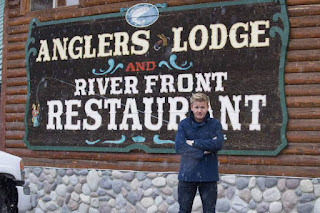 In this Hotel Hell episode, Gordon Ramsay visits Angler's Lodge, Island Park, Idaho where husband and wife team Dave and Dede saw land for sale next to great fishing spots and decided to build the lodge as Dave believed he could fish and run the business. Business was booming and they were looking to expand when they tragically lost their 10 year old son Dalton. Gordon is stunned to discover that the owners have built the lodge themselves and live on a cabin on the property. For the first two years, there was a 2 hour wait for the restaurant but after they made changes the customers began to dwindle. Gordon is shown to his room by Sam and finds a stain on his bedding and comments that the view is breathtaking but the room is depressing, dark, and the pillows are uninviting. He pulls out the filter of the air con unit and finds it caked in dust. Gordon orders the wings in home made BBQ sauce and discovers that they are frozen, the rib eye is soaked in alcohol, overcooked, the rice served with the curry is mush and the trout has multiple sauces, the skin and scales on and is the worst trout Gordon has ever seen. Gordon is shocked to discover that Dave and Dede dislike Gina's food but that they take what they can get when it comes to Chefs. Gordon arrives to watch a dinner service and is shocked to discover a collapsed cheesecake in the fridge and a server chewing gum. The chef and the sous chef don't say a word to each other and Gina refuses to allow the other kitchen staff to do their jobs. Gordon speaks to the locals about the lodge as it is a small community. The locals feel like they have been pushed away by the owners, they don't know how to deal with customers or care about the customers but they are willing to come back. Gordon takes Dave away to the car to have a chat, asking the cameras to leave them alone. They talk about Dave's negativity, the initial lack of support from the locals, the lack of staff commitment and how he dealt with the loss of their son. Gordon's team gives the lodge a big makeover in the rooms, more rustic with light colours on the walls. There is a new menu and Gordon's team have been teaching the staff how to cook the menu. Gordon has invited both locals and a local food critic to sample the new food. Gina struggles to read the orders, fails to communicate with the staff and refuses to allow the sous chef to dress a salad. Gordon reveals that he will be sending in consultant Emily for a month and that Dave and Dede will be having dinner in the restaurant that evening. The locals enjoy the food and Dave and Dede are all smiles, toasting the new lodge as Gordon leaves, or attempts to but struggles with his hire car. After the show was filmed in October/November 2015, the family embraced the menu changes and was excited for the future. Their passion is rekindled for the lodge. Trip Advisor reviews are mixed since Gordons visit and Yelp reviews are mostly positive. Planning a visit to the hotel? Check out their website for further information. Anglers Lodge aired on May 24 2016, the episode was filmed in November 2015 and is Hotel Hell season 3 episode 1. I saw this show on hulu. I love vacations so I am hoping in the near future to book an hotel stay and enjoy great food, people and adventures. so happy this family found some peace. Losing a child is unimaginably difficult. Kudos that they made it through.